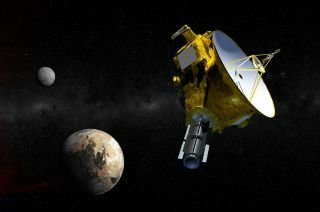 More science results from the New Horizons space probe will be announced by the mission team on July 24. Get ready Plutophiles: today (July 24), NASA's New Horizons mission is set to reveal more amazing science results about everyone's favorite dwarf planet. NASA's New Horizons spacecraft made its close flyby of Pluto on July 14, when the probe came to within 7,800 miles (12,500 kilometers) of the dwarf planet's surface. The jaw-dropping images of Pluto and science results released since then are only the tip of the iceberg — it will take 16 months for scientists on Earth to download all the incredible images and scientific data collected during that encounter. Representatives of the mission will reveal the latest science results in a press briefing tomorrow (July 24) at 2 p.m. EDT (1800 GMT), and you can watch it live here on Space.com. Participants in the briefing will include Jim Green, director of Planetary Science at NASA Headquarters; Alan Stern, New Horizons principal investigator at Southwest Research Institute (SwRI) in Boulder, Colorado; Michael Summers, a New Horizons co-investigator at George Mason University in Fairfax, Virginia; William McKinnon, a New Horizons co-investigator at Washington University in St. Louis; Cathy Olkin, a New Horizons deputy project scientist at SwRI. "This system is amazing," Stern said of the dwarf planet and its five moons, in a media event on July 15. Among other new discoveries, scientists now know that Pluto is home to mountains that stretch 11,000 feet above the surface, and that are likely built on a bedrock of water ice. Both Pluto and Charon appear to be geologically active, which challenges previously held theories about the internal workings of ice bodies. New Horizons has also captured the first clear images of two of Pluto's smaller moons, Nix and Hydra. Shortly after the New Horizons probe successfully completed its close encounter of the Pluto system, Stern noted that there would be a "16-month data waterfall," as the spacecraft slowly sends the information it collected during the flyby back to Earth. It seems the New Horizons team is busy hunting for more incredible scientific gems in cache of information.